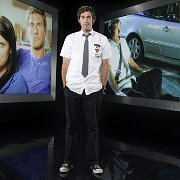 Photo gallery of Zachary Levi wearing black high top chucks in his role as Chuck on the series of the same name. 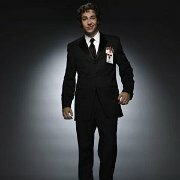 1 Chuck Television Series Publicity still of the cast of Chuck. Left to right: Sarah Lancaster, Adam Baldwin, Zachary Levi, Yvonne Strahovski, Joshua Gomez. 2 Chuck Television Series Yvonne Strahovski, Zachary Levi, and Adam Baldwin. 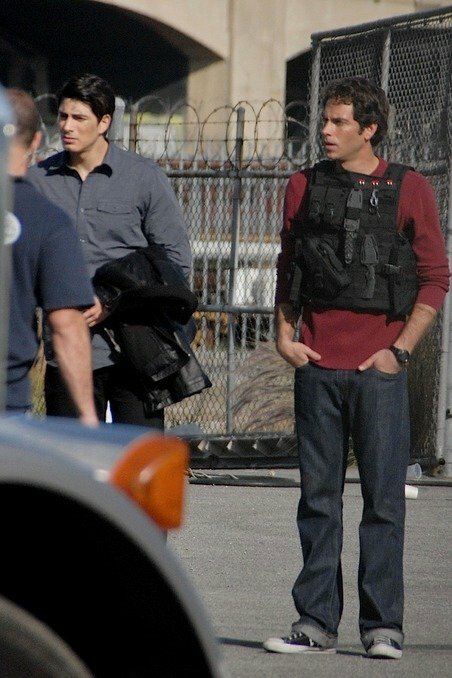 3 Chuck Television Series Zachary Levi and Joshua Gomez. 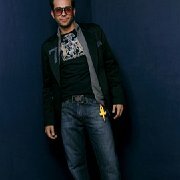 4 Chuck Television Series Casual photo of Zachary Levi. 5 Chuck Television Series Chuck and Morgan hiding out from Ellie's party. 6 Chuck Television Series Ellie and Chuck share a toast at the end of the party (pilot episode). 7 Chuck Television Series Chuck goes to check out a mysterious e-mail that has just arrived. 8 Chuck Television Series Chuck is mesmerized by the email which is downloading a national security computer in the form of encrypted images. 9 Chuck Television Series Chuck walking down the aisle of a warehouse hardware store, shot 1. 10 Chuck Television Series Chuck walking down the aisle of a warehouse hardware store, shot 2. 11 Chuck Television Series Chuck laces up his best pair of black high top chucks for his date with Sarah. 12 Chuck Television Series Cast shot on location. 13 Chuck Television Series At the warehouse storage area. 14 Chuck Television Series Adma Baldwin and Zachary Levi. 15 Chuck Television Series Adma Baldwin and Zachary Levi. 16 Chuck Television Series The cast of Chuck. 17 Chuck Television Series The cast of Chuck. 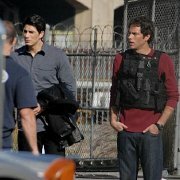 18 Chuck Television Series The cast of Chuck. 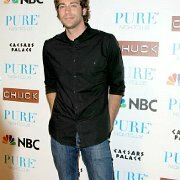 19 Chuck Television Series Zachary Levi. 20 Chuck Television Series Adam Baldwin, Yvonne Strahovski and Zachary Levi. 21 Chuck Television Series Sarah Lancaster, Zachary Levi, and Joshua Gomez. 22 Chuck Television Series Adam Baldwin, Yvonne Strahovski and Zachary Levi. 23 Chuck Television Series Adam Baldwin, Yvonne Strahovski and Zachary Levi. 24 Chuck Television Series Stunt from the show. 25 Chuck Television Series Adam Baldwin, Yvonne Strahovski and Zachary Levi. 26 Chuck Television Series Yvonne Strahovski and Zachary Levi. 27 Chuck Television Series Joshua Gomez, Sarah Lancaster, Adam Baldwin, Zachary Levi, and Yvonne Strahovski. 28 Chuck Television Series Zachary Levi. 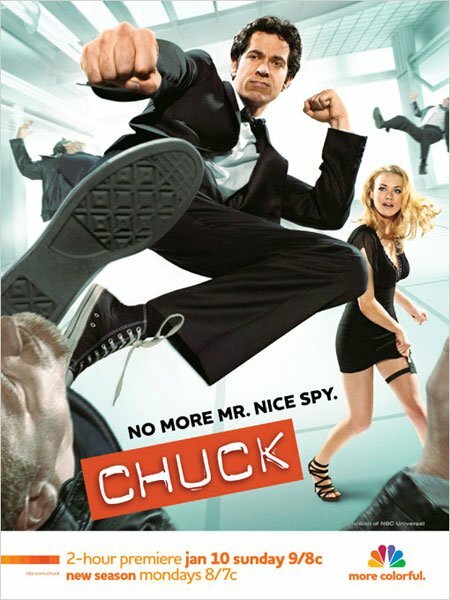 29 Chuck Television Series Poster for the second season of Chuck. 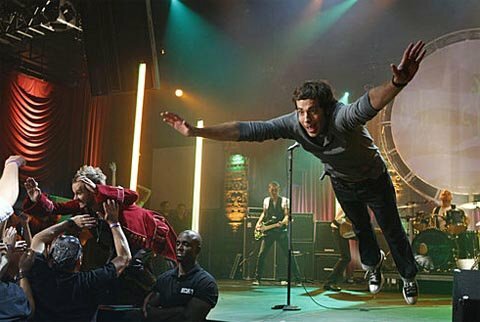 30 Chuck Television Series Still from Chuck episode "Chuck vs. The Helicopter"
31 Chuck Television Series Zachary Levi. 32 Chuck Television Series Post for the series. 33 Chuck Television Series Yvonne Strahovski and Zachary Levi. 34 Chuck Television Series Cast shot of Chuck. 35 Chuck Television Series Zachary Levi. 36 Chuck Television Series Casual shot of Zachary Levi. 37 Chuck Television Series Zachary Levi at a photo shoot inside Caesars Palace Resort Hotel Casino, Las Vegas, Nevada.